Tonight we got to see the continuation of last week’s Doctor Who episode “The Magician’s Apprentice” which was called “The Witch’s Familiar“. As always, beware of Spoilers from this point onwards!!! Can I just say one thing up front? I WILL NOT ACCEPT SUNGLASSES INSTEAD OF A SONIC SCREWDRIVER! NOT EVER! Puh, now that that is out of the way, I can continue. 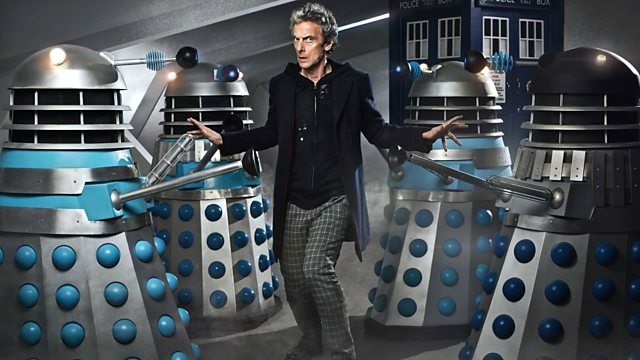 The Doctor may be without friends, without the TARDIS and without his Sonic Screwdriver, but he can still manage to stay alive surrounded by who knows how many Daleks. He has an “honest” heart to heart with Davros, while really they just keep deceiving each other (seriously – who can think that far ahead except for the Doctor?). Meanwhile Clara and Missy of course aren’t dead, neither is the TARDIS lost forever. Everything ends with the Daleks basically destroying themselves. Sorry for keeping the summary a bit short, but I am guessing you watched it already anyway and I wanted it to be more succinct than last week. I thought we would jump in right where we left of, but instead that particular scene with young Davros is kept for the very end. I liked the Witch’s Familiar a bit better than the Magician’s Apprentice. It felt more focused and had some really nice surprises in there. The thing is, Moffat had to come up with some freaking good reasons as to how things could revert from the dire state of last episode and I am glad he took some time to explain. I thought the Clara and Missy teleporting-story was quite alright and the TARDIS was always capable of relocating itself I guess, so it made sense. What I probably liked most about the episode was a more vulnerable and partially funny Davros. Even if it was only fake, it was still interesting to see him pose all those questions. In fact very similar questions to the ones the Doctor asked himself last season aka “Am I a good man?”. Also, pushing him about why he left Gallifrey in the first place and the constant references to the Doctor being the one constantly on the run made me curious. I personally didn’t enjoy the Clara-Missy team-up very much; they have terrible chemistry – which could have something to do with the fact that Missy keeps trying to kill Clara. However, I did like the translation from human to Dalek. It was so interesting to see how their brains work and made me wonder if sometimes they have to say things they don’t actually mean. As for the end and the whole mercy-business though, I thought that was strange. Why was the Doctor so surprised that the Dalek knew the word “mercy”? They’ve used it before (watch proof by clicking here), maybe not in the same context but they have used it. It felt like this time around the focus was more balanced between showing the Doctor and his companion(s). The story could have used some more depth every now and then (e.g. I was a bit confused about the Colony of Sarff’s role), but I think it was a satisfying conclusion. Now, if only we could keep exploring Twelve’s motives some more in the future. On a completely different note, I am assuming that the titles of the two episodes were referring to the Doctor being seen as a magician or witch, but beyond that I have no idea what their connection was to the actual content of the episodes. If you do have more insight on that than me, please enlighten me! When it comes to the rest of this season, I am looking forward to finding out what’s in the confession dial. What about you? Thoughts on any of this? Liebster Award – here we go again! Personally, I thought that this episode was good, but not as good as I expecting. It was a bit slower-paced than the last episode, which I’m not sure I liked. And while watching the heart-to-heart, I was expecting some sort of twist (not sure what sort, so I was surprised with the regeneration energy bit), but I’m not sure I buy the Doctor guessing Davros’ plan and planning for it accordingly. I know he’s clever, but this is bordering on the precognitive! And my God, Davros looks like a troll or a witch out of a fantasy movie with his eyes open! Still, I liked seeing Clara as a Dalek, that was an interesting throwback to her first appearance on the show. And while the Clara-Missy team up was awful, it was awful in a good way, and I wouldn’t expect any less of them, which made it fun to watch. I also found the sewer scenes delightfully creepy, and I felt the ending was pretty good, a great wrap-up for an episode where we never truly knew what was happening. As for the “Mercy” thing, I have a theory: Davros is constantly tinkering with his Daleks, trying to improve them so that they stay “supreme”. At some point he could’ve added “Mercy” to their vocabulary, especially if a memory (like seeing the Doctor and realizing he’s the man from his youth) is triggered. As for the sunglasses vs. sonic screwdriver, I have thoughts on that as well: in the classic series the Doctor first got his screwdriver as the Second Doctor, used it sparingly through the Third and Fourth Doctors, and lost it as the Fifth Doctor. It wouldn’t show up again except for a small appearance in the TV movie until 2005, where it lasts through three Doctors and gets lost or destroyed on the revived series’ fourth actor to play the Doctor. Not sure why they decided to lose it–maybe it is too much of a catch-all tool–but they may decide to bring it back depending on viewer reactions. Personally I’d prefer it if they did, and I think they might do it during the Christmas special, seeing as River Song’s coming back and we haven’t seen her receive her own screwdriver yet. And as for the titles, I think they refer to Clara in a way: the Doctor was called a magician in the first episode, and Clara is somewhat of an apprentice to him, seeing as she’s played the role of the Doctor before and has even become a UNIT agent over her tenure as a companion. The second episode refers to Clara working with Missy and being a Dalek for a short time, which brings out her darker emotions a little (and if an evil witch’s familiar isn’t at least a little bit dark, then I’m a Sontaran). Okay, wow, let’s go through this point by point. I actually really liked that it was slower. That was one of the reasons I enjoyed it more. I didn’t buy it either that the Doctor knew about what Davros was up to. Seeing Clara as a Dalek was cool, but that doesn’t mean I enjoyed her time with Missy. I just don’t particularly like Missy at all (and believe me, I know that I am fairly alone in having this opinion). As for “mercy” – I wasn’t wondering about how Daleks were able to say it, but rather why the Doctor was so surprised about it. He felt that he was the reason they knew about it, but it was far from being the first time that I heard a Dalek use the word. That was what was confusing me. It didn’t feel that significant to me. I am 100% against sonic sunglasses. Yeah, I got that the titles referred to the Doctor and Clara but I don’t get what magicians and witches have to do with Davros, Daleks and Skaro. I guess they needed titles. And have any of the times the Daleks asked for mercy the Doctor been there to witness it? I mean, he’s definitely witnessed them say it’s not a word they understand, but never seen them ask for it. Maybe that’s why he’s confused. Okay, maybe he never personally witnessed it. But we as an audience did which makes it a little less significant in my eyes. Does that make sense? I guess. At least we understand next week’s title very well: it’s an underwater base, which is why it’s called “In the Lake” or “Below the Lake” or whatever. It’s “Under the Lake” 😉 but yeah, that makes sense. And I may be back in the States when I watch it. Goodness, there’s a thought. Time’s just flying by, huh? I thought that the “Witch”, at least, referred to Missy in Part Two. However, there was really no “apprentice” in Part One. Unless you put an emphasis on the Missy/Clara interactions beyond that which the two actresses brought out in the episodes. Yeah, I can see the Witch being Missy too. I just still didn’t see the connection between the content of the episodes and the titles. That was just strange for me. They mostly make sense. I apparently wasn’t as critical this time around, but I know what you mean by typical Moffat. It really could have been better!